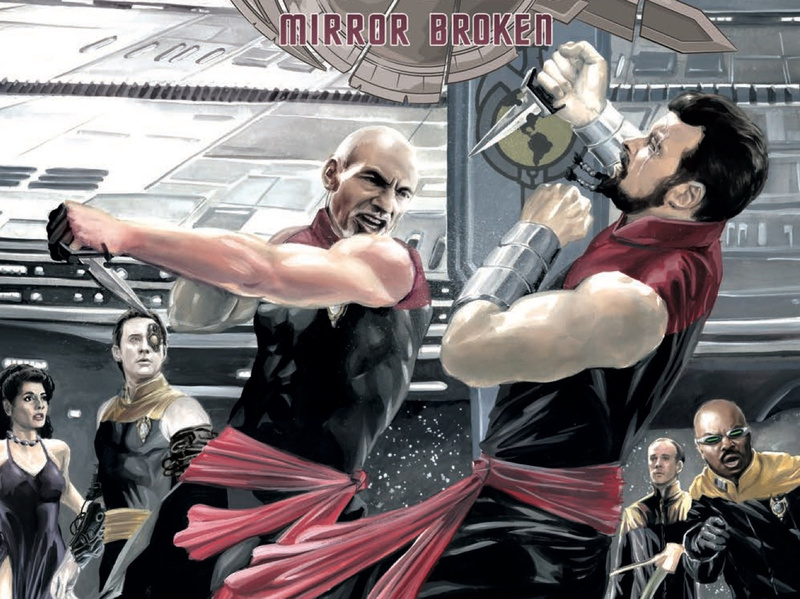 Star Trek: The Next Generation: Mirror Broken #2 Review – AiPT! The explosively awesome first issue of this series not only brought you back to how good the characters are, but how much better they can be if they’re evil bastards too. Scott Tipton and David Tipton wrote an exciting issue that twists the goodness of the series in all the right ways including making the Mirror Broken universe a bit run down. The characters are just trying to survive–how can you blame them, as they exist in a universe where humans are survivalists first? Read our preview to find out! Taking the original Star Trek episode where Spock has a goatee (and is super evil), this series carries that universe forward and it comes with all the dark and twisted changes that are easy to delight in. If you’re a fan of Mad Max I could see you really enjoying this as the run down nature of the world, and immoral nature of the characters, are great fun to explore. This issue opens with Picard working out–certainly something we don’t normally see–and it explains why these characters go sleeveless. His guns are impressive, but before he can finish his last set one of his own crew members attempts to kill him. Just another day as captain! Scott Tipton and David Tipton continue to write these characters very well and you’ll find it easy to slip into their accents while you read their dialogue. The thing is, their twisted evil nature makes them strangely off, which makes their interactions that much more fun to read. Can’t a man get his lift on!? The plot of this issue basically follows two arcs, the first being Picard and his men preparing a trustworthy crew after they steal the Enterprise–the greatest ship ever built–and Picard getting a bit closer to acquiring his first mate Riker. And by acquiring, I mean a full on bare-knuckle fight sequence! Picard’s plan includes scenes with Data, Troi, and La Forge, all of which imbue a sense of evil that’s delectable. It’s also fun to see how these characters live in a world where they can’t trust anybody, which makes Picard’s leadership all the more compelling. J.K. Woodward should earn all the awards when it comes to Picard and Riker’s fight sequence. This battle is excellent and the photorealistic faces make the scene all the more awesome. It plays out how you’d expect from these two dirty fighters and it’s great fun. Most of the art in the issue is quite nice and the color palette changes well between scenes. Take Data’s scene, where there’s a lot of grays used to make the scene feel cold. Or with La Forge, his scene uses the brightness out the windows to make his convincing of an ex almost romantic. Overall the art always seems to help tell the story that much more. These expressions are really throwing me off. But seriously, sometimes the art can be perplexing or downright weird. It really only hit me in one early scene, where Picard is telling Troi the plan. Picard looks great in every panel, but the reactions of Troi and others in the shots are downright baffling (see above). When Picard explains the plan is on track, for instance, Barclay looks like he’s holding in a fart, and then in another panel as Picard tells Troi he needs her powers to move forward on his plan she looks shocked. The facial expressions totally throw you out of this scene and make you wonder why they’re so off. Save for some awkward facial expressions in one scene this is another fantastic issue. I can’t help but love this take on the characters and there are so many variables, with such great plotting, it’s irresistibly entertaining all the way through. A solid second issue that progresses the story and continues to write these characters oh so well.